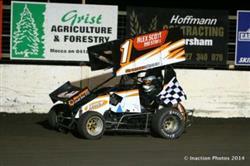 The Victorian Mini Sprint Club finished up their three round ‘Hurricane Automotive Products’ Wild West Shootout held at Redline Raceway this season with a final round victory to Darren Schnoor whilst Victorian champion Brad Lowe ran out the overall winner of the series in his last ever Mini Sprint race meeting. The 2016/17 Victorian Mini Sprint Club season got underway at Redline Raceway on top of a mountain on a wet and miserable night, where the beginning of the new & exciting ‘Hurricane Automotive Products’ Wild West Shootout finished with a victory to Dave May. A lot has happened in this off season for competitors involved in the Victorian Mini Sprint Club with new leadership voted in at the AGM, new drivers committing to the class & new ideas being agreed to in order to make the racing even more appealing to the promoting venues and drivers keen to go racing. The Victorian Mini Sprints recently headed to Drouin Speedway for the second & annual Mighty Mouse Magic in honour of Colin Lindell who was known as the driver of the Mighty Mouse car back in his day, it would be local Warragul race driver Matt Parsons who would come away with victory. The Victorian Mini Sprints 2014/15 Gold Cup series continued with the latest round at Ballarat’s Redline Raceway held on Sunday the 8th of March & in a barnstorming display, Victorian Champion Dave May romped to victory ahead of Kevin Bomford & Matt Parsons in a super quick display by all competitors. 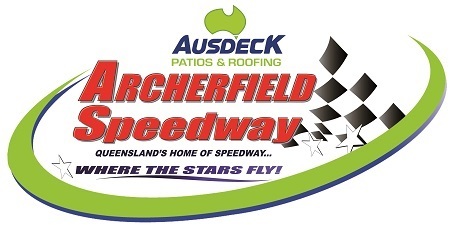 This Saturday night Bangholme based truck driver, Owen Bulman will set out to achieve his best ever & most memorable speedway result if he can claim a podium result in the Victorian Mini Sprint title at Nyora Raceway, & true of any real racer, Bulman is not content with just finishing with a podium result, he wants the win. 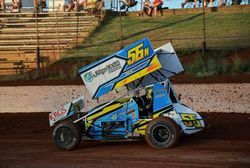 Matt Parsons has won Mini Sprint Gold Cup Series, he has won two Geoff Moule Memorials, however could he this Saturday win the main show & become a Victorian title winner when the division competes at Nyora Raceway for this year’s championship event. 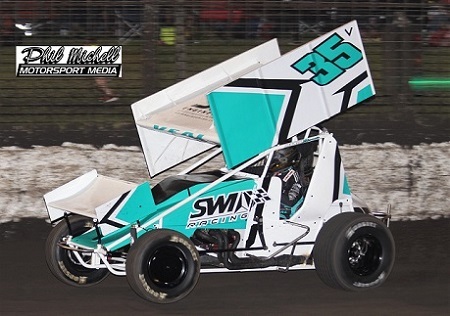 In exciting news for the Victorian Mini Sprint title at Nyora Raceway on Saturday night, last year’s champion Owen Milton will be back to defend his title making things just a little tougher than they already were for the current crop of competitors in the division. Former Victorian Dirt Modified Champion Dave May heads to Nyora Raceway with a little redemption in mind & a focus on claiming a first Victorian Mini Sprint title win or at the very least a podium result, however is fully aware it isn't going to be easy against the likes of Matt Parsons, Kevin Bomford & Owen Bulman next Saturday night. 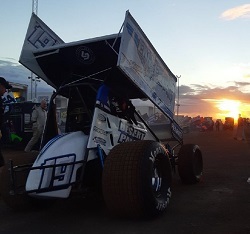 Leongatha resident & Victorian Mini Sprint competitor Darren Schnoor is looking to score a podium result at next weekends Victorian Speedway Council governed Victorian Mini Sprint Title & 'Schnoorey' just cannot wait for the flag to drop to start the show. Tyabb youngster Luke Hickson grew up at Nyora Raceway & fittingly his first Victorian Title in his first senior speedway division, the Victorian Mini Sprints will be held at his home track on the 7th of February. The Victorian Mini Sprints returned to Redline Raceway for a club points show on Saturday the 13th of December & despite efforts from Sydney race driver Shane Cooper & a charging Kevin Bomford, it would be Dave May who would go on to record victory in fine style, a small redemption for a recent indiscretion at Nyora that cost the team a win there. The Victorian Mini Sprint Club began their season on Sunday the 9th of November at Drouin Speedway with round one of the ‘Gold Cup’ series with a mixture of rookie racers and experienced drivers giving an entertaining account of themselves as Dave May went on to take a win in front of Owen Bulman & Jason Lynn. Drouin Speedway hosted the previously postponed February round of the Gold Cup Series on the 1st of June which also was the Gippsland Zone Mini Sprint title and the win went by the way of the closest resident to Drouin, Warragul’s Matt Parsons who led home new entrant to the division Dave May & Kevin Bomford. It’s been a couple weeks now since the Victorian Champion for Mini Sprints was decided and the thrill of the win is still giving race driver Owen Milton great satisfaction and enjoyment as he prepares to embark on a Formula 500 race career in the new season after clinching the back to back championship result in Mini Sprints. 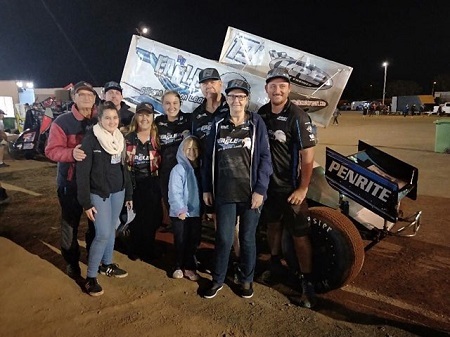 Peter Schnoor heads back to Mid-Western Speedway this weekend for the Victorian Mini Sprint title and after a podium finish early in the season at the venue confidence has Schnoor believing he could be a top five state title finisher. Bill Jubber is one of a kind. It’s no secret that current Victorian Mini Sprint Victorian Champion Owen Milton is on his way to the Formula 500 division, having already dabbled in the class this season mostly in speed week, however Milton is keen to put a tough run at Bairnsdale & Rosedale at Easter to defend his position at the top of the Mini Sprint ranks before he sets off for new challenges. 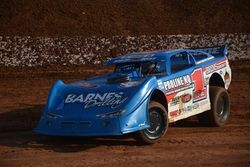 Current Victoria # 2 and now New South Wales # 4 race driver Stuart Ferguson is keen to add a second Victorian title victory to his name when he hits the track this weekend at Mid-Western Speedway Darlington as one half of a two car team with his son Luke and both are in the top 6 favourites in the field to possibly go on and seal the deal and become # 1. Tuesday May 6, 2014 CAN MUTLEY BECOME THE TOP DOG AT MID WESTERN? 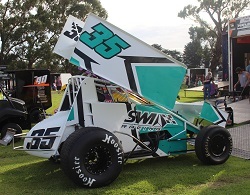 Matt ‘Mutley’ Parsons is raring to get off the leash and rocket around Mid-Western Speedway this Saturday night when the Victorian Speedway Council aligned Victorian Mini Sprints Club run their state title at the wicked little venue nestled in Darlington about an hour north-west of Geelong.